Written by alessandro on January 25, 2018 . Posted in All Stories, Curiosity, Discover Rome, Itinerary, Museum, Museum. 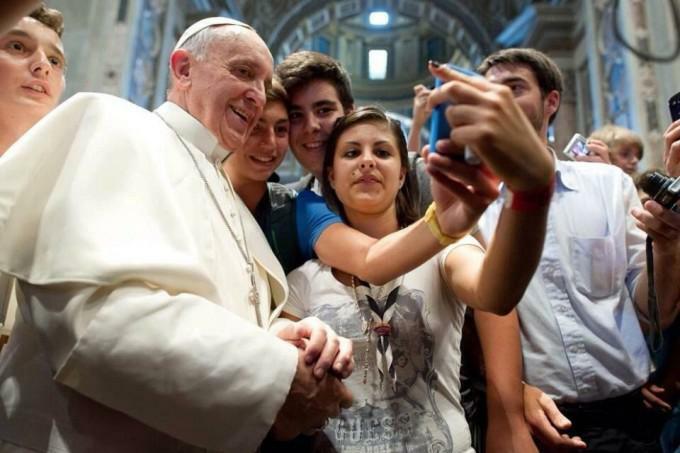 All the activities of Pope Francesco are listed on the official site, www.vatican.va . We recommend that you visit this site prior to visiting Rome to see the activities of the Holy Father, which are not listed only week by week, but they inform his faithful followers of his last minute engagements. Obviously, you understand why. To meet the new Pope other than all’Angelus in the square at St. Peter’s, there are public audiences. The Prefecture of the Papal Home regulates access to the audiences that are always free, but entrance is made only with an invitation. There are two ways to request an invite. Send a fax to 06 698 858 63 to the Prefecture of the Papal Home open weekdays from 9:00-1:00 pm and indicate which audience you would like to attend and how many participants will be attending, or you can request by ordinary mail to the following address: Prefecture of the Papal Home, 00120 Vatican City. Regarding the Vatican Museums instead you should know that the last Sunday of each month has free access. The last Sunday of every month is also the only Sunday where the Vatican Museum is open , along with the Sistine Chapel, not always open during the weekdays. To visit the Vatican Museum during free entry days is quite trying, not just for the river of people that winds around the building in a long waiting line, but logistically we are speaking the way in which they manage the crowd. We personally suggest you arrive one hour in advance to entrance time. 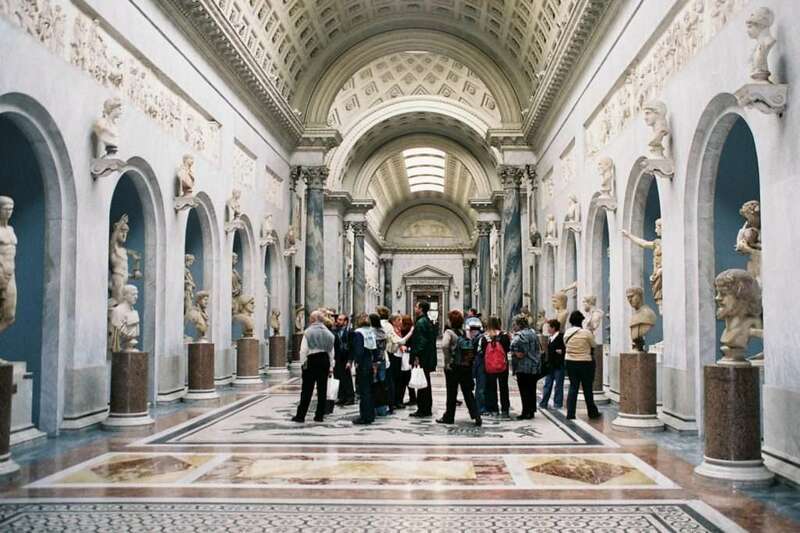 From Monday to Saturday , from 9:00 am – 4:00pm, the Vatican Museums are open, with the expected closure at 6pm. The cost of the ticket is 16,00 euro, 8,00 euro ( reduced) for schools, 4,00 euro. 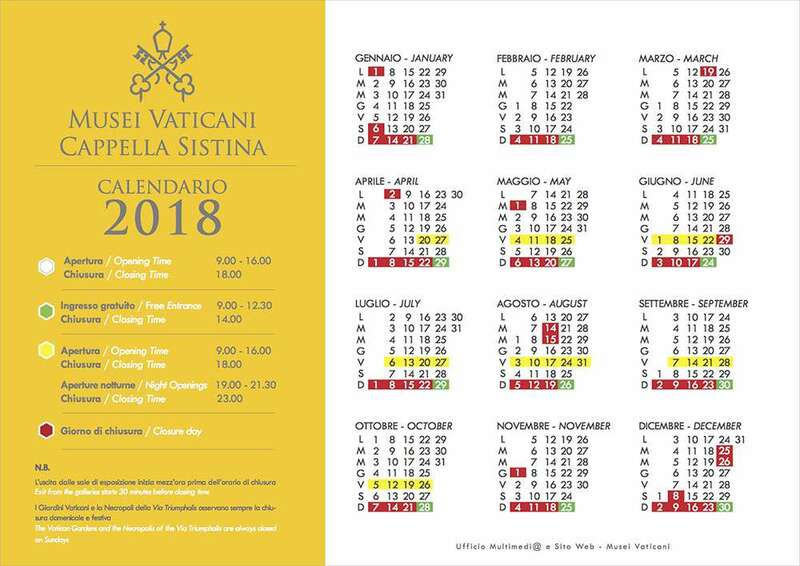 Here we have listed below, in an easy chart, the hours for the opening and closings of the Vatican Museum and The Sistine Chapel for the year 2018.